(CNSNews.com) – The Centers for Disease Control (CDC) updated a report last week illustrating on U.S. maps that the two mosquitoes with the potential to transmit the Zika virus, as well as other viruses such as dengue and chikungunya, could inhabit areas this summer that include parts of all but ten states in the United States. The CDC also verified to CNSNews.com via email that the map of potential exposure includes all but 10 states in the United States. 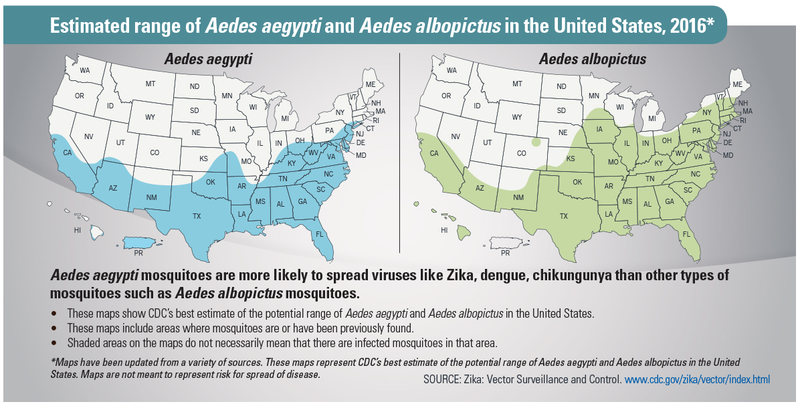 “These maps include areas where mosquitoes are or have been previously found as of 2016,” the CDC told CNSNews.com. “CDC is not able to predict exactly when Zika virus will arrive in the continental United States or how much the Zika virus could spread if and when local mosquito-borne transmission is detected,” the CDC told CNSNews.com. Mosquitoes qualify as the "deadliest animals in the world," the CDC told CNSnews.com, because they spread diseases such as chikungunya, dengue, zika, and malaria. In a Zika outbreak, the CDC reported, “people may not even know they are infected,” and “based on current knowledge, the greatest risk for complications from Zika is to a pregnant woman’s fetus,” as the disease “has been linked to cases of microcephaly, a serious birth defect, and is a sign that the baby is born with a smaller brain, which can result in medical problems and impaired development."